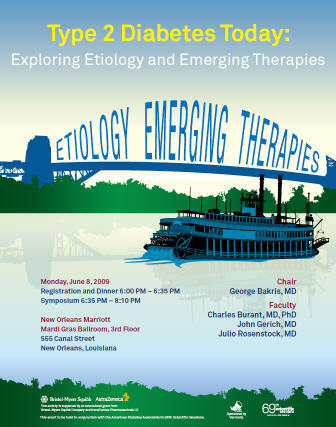 CMEPlanet.com is pleased to offer a Live Webcast CME Symposium taking place on Monday, June 8, 2009 at the 2009 American Diabetes Association 69th Scientific Sessions in New Orleans, LA starting at 6:30PM. May 26, 2009 - PRLog -- Hyperglycemia is the hallmark metabolic abnormality associated with type 2 diabetes. Once hyperglycemia has developed in the face of insulin resistance and failing pancreatic insulin secretion, the adverse effects of hyperglycemia begin to accumulate in many tissues. These effects, termed “glucotoxicity”, may combine with the effects of elevated lipids, and their synergistic effect leading to progressive hyperglycemia in type 2 diabetes has been termed “glucolipotoxicity”. The kidney plays a vital role in the regulation of glucose, reabsorbing 99% of the plasma glucose that filters through the renal glomeruli tubules. However, in hyperglycemic individuals, the kidney minimizes excretion of glucose in the urine (glucosuria), thereby exacerbating the hyperglycemia. Recent research has focused on the concept that inducing or enhancing glucosuria with pharmacologic therapy may not only decrease plasma glucose levels and glucose toxicity but also produce additional benefits. Given the limitations of existing therapies for hyperglycemia, these studies are providing insights into a potential role for inhibition of renal glucose reabsorption in the management of type 2 diabetes. Please register and login 15 minutes prior to the event start time. Supported by an educational grant from the Bristol-Myers Squibb and AstraZeneca Pharmaceuticals, LP, Alliance Partners. This event to be held in conjunction with the American Diabetes Association’s 69th Scientific Sessions.